Four Quarters' Outreach to represent at the upcoming NOVA Pagan Pride Day in Fairfax, VA, September 30. 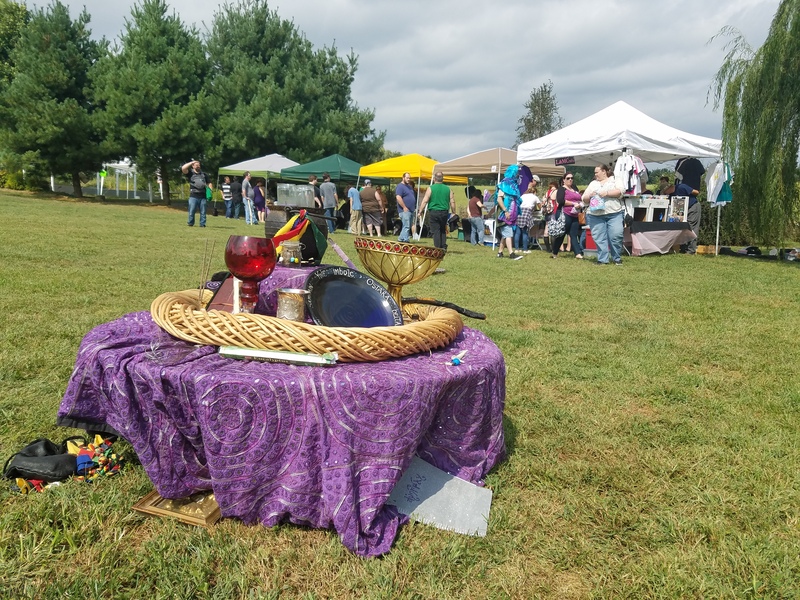 Another opportunity to help Four Quarters' Outreach efforts at the upcoming NOVA Pagan Pride Day in Fairfax, VA! Our outreach efforts are especially valuable, as the overwhelming majority of Four Quarters Members came to the Land based on word of mouth and reccomendation, over all other avenues combined! Join Four Quarters' Outreach efforts at the upcoming Pagan Pride Days this weekend in Frederick, MD and Washington, DC! The wheel of the year turns once more. There is a chill in the air and soon the trees will turn, presenting bright foliage of yellows, reds, oranges, and browns. It is the time of the autumn eqinox, and the time of Mabon. A word needs to be said about this years Rising. This is a special year for the Stone Circle, in as much as we will begin construction of "The North Copse." Older Members, perhaps much older Members, may recall Orren holding forth on The North Copse as a small elliptical feature set due North in the Stone Circle as a Circle within a Circle, in consonance with the Copse Features that frequently appear in the Neolithic structures of Northern Europe. A tightly spaced twenty foot ellipse of Standing Stones, the stones so closely spaced that they can not be walked through, and ideally cannot even be seen through. Conceived as a special place for prayer and contemplation. In two days, the Moon will be dark and the Sun will be eclipsed. We are passing through times of darkness, both literal and metaphorical. Come explore the power and transformation possible in periods of liminal light. We will be working ceremony by the river bank, and together we will send our prayers with the waters flowing through Four Quarters joining the waters of the Potomac, the Chesapeake Bay and the Atlantic. We hope to see you there! No cases of Norovirus have been reported since June 24. This includes 3 Church Service weekends and 3 events, including our largest one in late July when almost 3,000 people were on the Land. Four Quarters has instituted a “Health and Happiness” protocol: all persons entering the Land are given a printed booklet followed by a brief seminar focused on public health practices, and are quizzed on the information conveyed before being allowed to register. “May your road rise up to meet you.” This sign has stood next to the farmhouse for years, wishing outgoing guests a fond farewell. If you’ve driven the road to the Farm, you may also grasp the irony of these words. The driveway from Silver Mills to the Four Quarters entrance has long been in desperate need of repair.